On December 28, 2015, Japanese Foreign Minister Fumio Kishida and South Korean Foreign Minister Yun Byung-se announced that both sides had reached a “final and irreversible” deal on the comfort women issue. Since their agreement, both Japan and South Korea have proceeded to implement the deal. On July 28, 2016, South Korean government officially established the Foundation for Reconciliation and Healing, a non-governmental organization that aims to assist surviving comfort women and relatives of deceased comfort women. Japan, after a cabinet meeting on August 25, provided the promised 1 billion yen (roughly $9 million) to the Foundation for Reconciliation and Healing. South Korea’s Ministry of Foreign Affairs has also promised to disburse twenty million won (roughly $18,000) and one hundred million won (roughly $90,000) to the families of deceased comfort women and surviving comfort women, respectively. While the implementation process has begun, controversy surrounding the comfort women deal persists within Korea and this raises serious questions about whether South Korea can implement the comfort women deal and charter a new relationship with Japan. Opposition to the deal has manifested in many parts of Korean society. Surviving comfort women have already rejected disbursements from the foundation. They insist that the nature of payment should be compensatory, not consolatory. Compensation would entail that the Japanese government recognizes itself as primarily responsible for its wartime crimes related to comfort women and provide legal liability to make amends for its past misdeeds. Consolatory payments would be an easy exit for Japan to shirk away from legal responsibilities within an ambiguous context. The women go as far as to argue that without their consent, the South Korean government had absolutely no qualifications to negotiate or reach a deal, let alone call it “final and irreversible.” These women insist that the only means to restore their dignity is the Japanese government’s public apology and compensatory payments. The comfort women’s opposition to the deal is further evidenced by the continuation of the weekly Wednesday Demonstrations in front of the Japanese Embassy in Seoul, which started in 1992 to demand the Japanese government redress the comfort women issue. Another source of opposition comes from a coalition of South Korean civil society groups. These civil society groups, led by the Korean Council for Women Drafted for Military Sexual Slavery by Japan, have taken a series of steps to impede the implementation of the deal. Upon the announcement of the deal, this coalition of civil society groups immediately issued a statement rejecting and calling the deal a “diplomatic humiliation.” They have also established the Foundation for Justice and Remembrance to counter the South Korean government’s Foundation for Reconciliation and Peace and replace the government’s disbursements with voluntary donations from Koreans. They have also promised to expand their efforts to install more Statues of Peace, miniature statues of young comfort women, across South Korea and the world. Given the Japanese government’s sensitive attitude toward the statues and repeated demands to remove them, the coalition’s vocal opposition and their efforts to undermine the deal could pose a serious challenge for South Korea to put aside the comfort women issue. The parliamentary election results last April in South Korea will most likely pose further obstacles to implementing the comfort women deal as well. During the parliamentary elections, the ruling party lost its majority for the first time in 16 years. The chairman and chairwomen of the two opposition parties that now control the majority in the parliament have indicated that they staunchly oppose the comfort women deal. People’s Party leader and presidential hopeful An Cheol-soo has called for the Park administration to “abandon the deal immediately.” The newly elected chairwoman of the Minjoo Party of Korea, Choo Mi-ae, has defined the comfort women deal as an “unprecedented diplomatic catastrophe.” With opposition parties as the majority in the parliament, President Park Geun-hye will undoubtedly face further obstacles to implementing the deal during the remainder of her term in office. Despite the skepticism and growing opposition toward the comfort women deal, South Korea is unlikely to renegotiate or abandon the deal. To reiterate the words of Japanese and South Korean foreign ministers, the deal is “final and irreversible.” Should South Korea decide to abandon the deal, such action would seriously harm South Korea’s credibility with Japan and its future diplomatic conduct with other nations. More important, South Korea’s withdrawal from the deal would not only damage its relations with Japan but also its alliance with the United States, which has long been frustrated over tensions between its two major allies in the Asia-Pacific. The comfort women deal is no longer just a diplomatic issue between South Korea and Japan, but primarily a sensitive domestic issue within South Korea on how to implement the deal. The main task for Park is not to defy the opposition but instead to integrate them into the implementation process. The Park administration will need to persuade the surviving comfort women and relatives of deceased comfort women, the civil society groups, and the opposition parties to participate in the implementation process. This will be a daunting task, but unless the Park administration can bridge the perception gap between the government and its people, the comfort women agreement will only sow the seeds of discord within Korea and add to further impasse in Korea-Japan relations in the days to come. 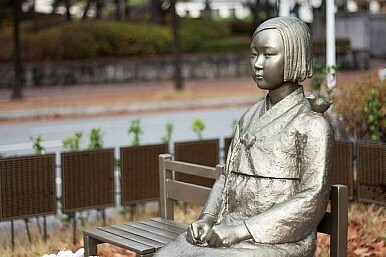 The comfort women deal has been largely heralded by numerous experts as an example of successful diplomacy, but its success actually depends on how Park can reconcile disagreements within Korean society and effectively implement the deal. Only then will the comfort women deal become a new starting point to reconcile historical legacies in South Korea-Japan relations and chart a path toward future-oriented bilateral relations. With popular support, the Japan-South Korea comfort women agreement seems likely to succeed.